Ascorbic acid (C6H8O6) is the most common form of vitamin C. "It is an essential food for human beings. People who receive no ascorbic acid become sick and die." - Linus Pauling (Vitamin C and the Common Cold, 1970). "Ascorbic acid (vitamin C) is one of the important water soluble vitamins. It is essential for collagen, carnitine and neurotransmitters biosynthesis. Most plants and animals synthesize ascorbic acid for their own requirement. However, apes and humans can not synthesize ascorbic acid due to lack of an enzyme gulonolactone oxidase. Hence, ascorbic acid has to be supplemented mainly through fruits, vegetables and tablets." Read the full article "Vitamin C in Human Health and Disease is Still a Mystery? An Overview"
Most writers use "vitamin C" and "ascorbic acid" interchangeably. However, ascorbic acid is but one form of vitamin C.
Technically vitamin C is the ascorbate ion (C6H7O6) so every form of vitamin C has this anti-scurvy factor. Vitamin C comes in many forms because the vitamin C part (C6H7O6) easily combines with other atoms and molecules. For example, the ascorbate fraction rapidly attaches to hydrogen, sodium, calcium, magnesium and potassium atoms. All forms of vitamin C can be called ascorbates. Even the most common form of vitamin C, ascorbic acid, is hydrogen ascorbate (the ascorbate ion attached to a hydrogen atom). 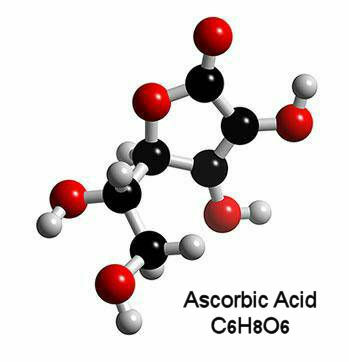 Ascorbic acid is a weak acid; its acidity is about that of a cola soft drink. Vitamin C does not have to be acidic. It is also found in various alkaline forms, such as the mineral ascorbates sodium ascorbate, calcium ascorbate, magnesium ascorbate, and potassium ascorbate, etc. Ascorbate has different shapes in three-dimensional space. The different shapes of the ascorbate fraction have the same atoms, but the atoms are arranged differently, much like the right hand is the same but different from the left hand. Chemists call the difference between the same molecules their chirality. Linus Pauling explained that there are exactly four different shapes (stereoisomers) the ascorbate ion can take: L-ascorbate, D-ascorbate, LD-ascorbate and DL-ascorbate. Linus Pauling the chemist also told us that only the L-ascorbate shape has vitamin C activity, i.e. only the L- shape can cure the vitamin C deficiency disease scurvy. Vitamin C - What do you Need? "While known to scientists like myself, the public and most doctors are totally unaware that synthesizing vitamin C produces two very different molecules. These are: D-ascorbate and L-ascorbate. Almost all the vitamin C on the market is roughly a 50/50 mixture of the two. Only the L-ascorbate is biologically beneficial to the body. D-ascorbate is an irritant to the body, and there are indications that a lot of D-ascorbate could be detrimental to health. Scientists are now using the more technically correct term ascorbate, instead of vitamin C, especially when referring to dosages higher than the 10 to 60 milligrams daily that prevent death from acute scurvy. Most vitamins are readily available in food and are only required in minuscule amounts by the animals that eat the food. It is true that tiny amounts of vitamin C (around 10 milligrams daily) can keep human beings alive by preventing death from the vitamin C deficiency disease scurvy. Therefore, the RDA (60-90 mg) keeps most of us alive. There is something different about vitamin C.
The intellectual argument whether vitamin C is more than just a vitamin is based on the theory of evolution. Genetic deletions are common, yet most plants and animals make their own vitamin C. Very few species have survived to the present day after losing their innate ability to make vitamin C.
"Vitamin C, ascorbic acid C6H8O6, isn't a vitamin for most species. It is not a necessary component of the diet, at least for all mammals with the exception of guinea pigs, fruit eating bats, the red vented bulbul bird and primates - which includes us. All other species make their own." - Read full article: How Much Is Enough? High dosages of ascorbate have been found to make many people feel better, making the case that ascorbic acid (C6H8O6) is not just a vitamin in the commonly used sense of the word. "Synthetic vitamin C, called ascorbic acid, in its first actual use on medical patients is producing very striking and unexpected disease conquests, the British Association for the Advancement of Science was informed by Prof. A. Szent-Györgyi, the Hungarian chemist who played a major role in the artificial manufacture of this important vitamin. The mouth disorder known as pyorrhea, a certain kind of hemophilia, which is a disease of bleeding, certain forms of hemorrhagic nephritis, and several other diseases against which medicine was helpless are seemingly being cured by ascorbic acid. Ascorbic acid is not a cure for hereditary hemophilia. Disfiguring colorations of the skin brought on by illness are also made to disappear by ascorbic acid. Patients with Addison's disease, who have a yellow color, can be bleached out again by the use of this substance." Why Do We Need More Vitamin C than the RDA? The intriguing question is whether larger-than-recommended amounts of vitamin C improve the health of human beings? Setup: Determine the largest single dosage that will not cause diarrhea. (This step must be done ahead of time, i.e. right now, if you are not a regular vitamin C "mega" doser.) The one-time dosage is usually 1.5 gram (healthy people) or 3 grams (feeling poorly) or 6 (up to 12 grams - chronically ill). Cleanse: Take the one-time maximum dosage every 15 minutes until the flush, i.e., watery discharge (loose stools don't count.) The watery flush usually occurs before the two hour mark. Note: When you are well, you can use Dr. Jaffe's Calibration procedure to help you estimate how much vitamin C you should be taking daily. 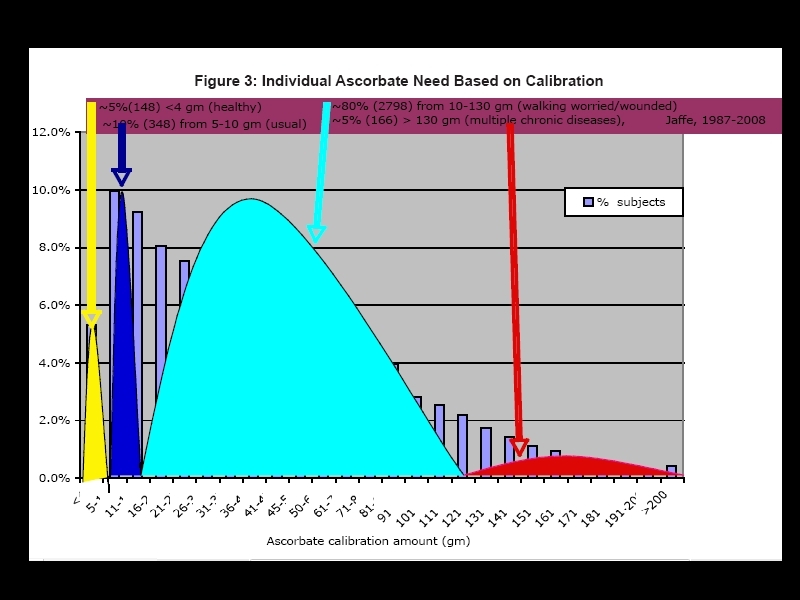 The optimal daily amount is usually put at 75% of your two-hour calibration. The late Robert Cathcart, III, MD reported that in his clinical practice of over 13,000 patients, (and later over 20,000 patients), that he occasionally used more then 200,000 milligrams of vitamin C. This report is detailed in his original 1986 "Vitamin C: Titrating to Bowel Tolerance" paper. Cathcart reported that our need for vitamin C increases in response to illness or stress. Nobelist and Chemist Linus Pauling became one of the world's foremost vitamin C experts. Pauling explained that there is a wealth of scientific research information that expands vitamin C's role past that of an ordinary vitamin. The Vitamin C Foundation's daily recommendation (RDA) is 3000 milligrams. Steve Hickey and Hiliary Roberts explain in Ridiculous Dietary Allowance why the current official recommendations are unscientific and inappropriate. According to Linus Pauling, vitamin C deficiency is more common in human beings than generally believed. The complete absence of vitamin C in the diet will cause death from the vitamin C deficiency disease scurvy. Nobelist Pauling felt that we are all dying a slow death from a low-grade form of scurvy. It is a fact that Linus Pauling and associates Unified Theory of Heart Disease [*] implicates a sub-clinical vitamin C deficiency leading to a condition Pauling called chronic scurvy. Cardiovascular diseases such as heart disease and stroke are the leading cause of death in the United States. Don't Tissues Saturate at 200 mg of Vitamin C? The erroneous idea that 200 mg of vitamin C is all our bodies can use daily arose out of important research by the Mark Levine group at the National Institutes of Health (NIH). The NIH papers were analyzed by pharmacology professors Steve Hickey, Ph.D. and Hilary Roberts, Ph.D., and the errors were communicated to the NIH and other authorities. After normal scientific channels failed, these UK scientists authored two important books detailing the errors in the NIH research conclusions. The basic flaw in the NIH research was not accounting for the short half life of ascorbate in the blood plasma. Using the NIH's own numbers, Hickey and Roberts developed their Dynamic Flow theory. Apparently the Linus Pauling Institute is aware of the faulty NIH research, but not of the Hickey/Roberts rebuttal arguments. One major implication of the Hickey/Roberts' Dynamic Flow theory is that taking 500 mg of vitamin C orally every 3 hours maintains the highest steady-state blood plasma concentrations. Natural Vitamin C-Complex - Fact or Fiction? "The old name for scurvy was scorbutes; so vitamin C, once identified, was quickly christened a-scorbutic acid; or ascorbic acid. Ignore the deluded ninnies that think ascorbic acid is something evil and not real vitamin C! It's as daft as saying H2O isn't water! And before you write to tell me: ascorbic acid is the name for both natural and synthetic vitamin C and BOTH work just fine, because they are identical. - Dr. Keith Scott-Mumby The Vitamin That Conquered The World! Is there really such a thing as natural vitamin C complex? Such a complex can be defined, but it isn't vitamin C.
If such a complex really exists with vitamin C activity (minus ascorbic acid), this fact escaped the attention of all world scientists, including Linus Pauling. Such a complex is not reported in over 100,000 published studies, papers, reports and scientific articles regarding ascorbic acid (C6H8O6). Vitamin C is defined as the substance that cures the deficiency disease scurvy. This separates the ascorbates (C6H7O6) from the ill-defined natural vitamin C complex. Note that any so-called natural complex, minus (C6H7O6) does not and cannot cure scurvy and, therefore, cannot be Vitamin C.
The claim that Ascorbic Acid isn't the real vitamin C is provably false. Please print, read and distribute as appropriate. 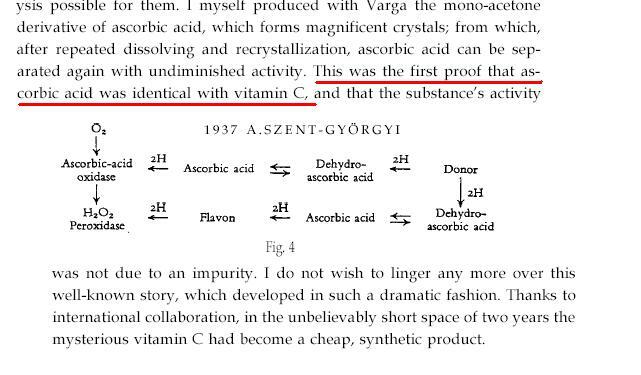 Those who argue that a vitamin C complex exists, and is different from ascorbic acid, usually claim (falsely) that the Nobel scientist credited with isolating Vitamin C, Professor A. Szent-Györgyi, believed in the so-called natural C-complex. This rumor is based on early speculation and misquotes earlier writings by Dr. Szent-Györgyi. Ascorbate Web One of the largest collections of vitamin C research on the web. Good overview. Excellent references. The authors make the common mistakes (e.g. they cite tissue saturation without explaining why animals produce so much more endogenous ascorbate than their own tissue saturation levels, etc.). The best source information for the lay person is Linus Pauling's 1986 book How to Live Longer and Feel Better. Eight Year-old Daniel Crawford's Science Project contains a procedure for testing for vitamin C content in foods.